Happy Halloween, everyone! Halloween just wouldn’t be complete without a few ghost stories, right? So for the sake of getting into the Halloween spirit, here are a few ghost stories featuring some familiar characters. If these stories are to be believed, if you’re in the right place at the right time, you might still have the chance to encounter some of Hollywood’s most legendary stars. Posted in Fun Stuff and tagged Clifton Webb, D.W. Griffith, Frances Farmer, Lon Chaney Sr., Marilyn Monroe, Montgomery Clift, Peg Entwistle, Rudolph Valentino, Thelma Todd, William Frawley on October 31, 2013 by Angela. 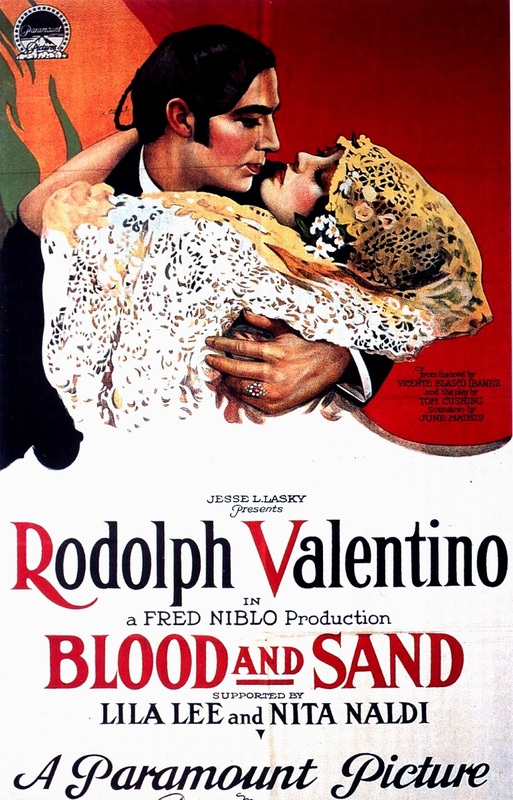 In 1926, it looked like Rudolph Valentino was back on track to reclaiming his title as one of the top stars of the silent screen. The last few years of his career had been riddled with studio contract disputes and box office disappointments. But then he started a new contract with United Artists and things started to look up again. His first film for United Artists, The Eagle, brought in good reviews and did modestly at the box office. 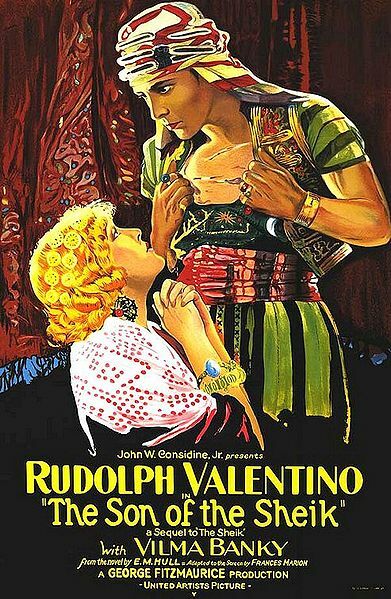 Then in 1926, Valentino had the opportunity to do The Son of the Sheik, a sequel to his 1921 sensation, The Sheik. Even though he loathed being known for The Sheik, he was in no position to turn down something that he knew would be a smash hit. He was right and when The Son of the Sheik was released in July of 1926, it was extremely well received. Some even hailed it his best film. Just over a month later, Valentino was dead at the age of 31. However, he would prove to be even more notorious dead as he was alive. The day of Valentino’s funeral has been dubbed “The Day Hollywood Wept.” It wasn’t the first time a big-name star had died, but it was the first celebrity death that turned into a total spectacle. There were reports of fans committing suicide. Speculation swirled about how he died. Surely a young man with Valentino’s reputation must have gone out in some fantastically scandalous way, right? Perhaps a heartbroken lover was out for revenge. 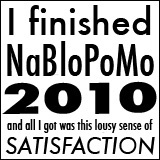 (Of course, the truth is far less exciting. He died from complications following surgery for a perforated ulcer.) When his body was laid out for viewing in New York, over a hundred thousand fans lined the streets for the chance to have one last look at their idol. Rumors circulated that the staff of the funeral home was so worried about his body being damaged by fans throwing themselves on the coffin that they secretly replaced his body with a wax mannequin for the viewing. Fans began to riot outside the funeral home and extra police had to be brought in to keep the crowd under control. Pola Negri, who claimed to be engaged to Valentino at the time, repeatedly fainted during the funeral service. The list of pallbearers read like a short list of who’s who in Hollywood and included names such as Douglas Fairbanks, Adolph Zukor, and Marcus Lowe. And that’s was just at the New York funeral. After his east coast memorial services, he was put on a train for a five day trip back to Hollywood. At every stop the train made, people came out to pay their respects. Once he made it back to Hollywood, there was another star-studded funeral and once again, thousands upon thousands of fans were there. Of course, there had to be a little behind the scenes drama as well. Given that Valentino died so young and so unexpectedly, he hadn’t come up with a burial plan for himself. Not only that, he was in quite a bit of debt at time of his death so not only did his estate not know where to put him, they didn’t have any money to do anything with him, either. June Mathis, who had written some of his most memorable films, offered the use of a mausoleum crypt she owned to hold him temporarily until a proper memorial could be built elsewhere. However, those memorial plans never materialized and the temporary solution became a permanent one. Valentino remains in that crypt to this day. Now, you might think that all the hullabaloo surrounding his death would die down after a while, right? Oh, no. Legends surrounding his death just kept on being born. On the first anniversary of his death, a mysterious woman dressed completely in black was spotted bringing flowers to his crypt and continued to do so every year after that. People wanted to know who she was and what compelled her to do this. Was she a devoted fan? A former lover? Or possibly just the creation of a press agent. The most accepted story is that The Lady in Black had met Valentino once when she was very ill and he assured her that she would go on to outlive him. All he asked is that she remember him when he was gone, so bringing him flowers was her way of honoring that request. Over the years, there have been several Ladies in Black and to this day, Ladies in Black still bring flowers to his crypt. 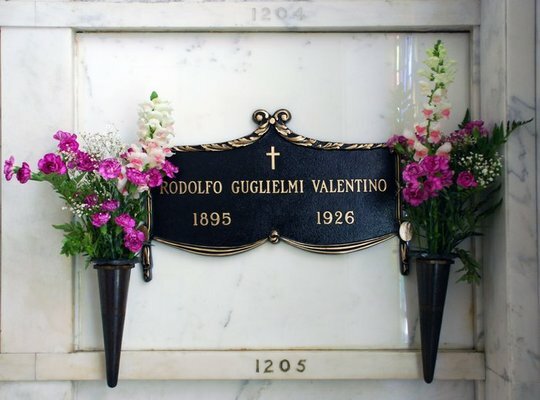 This August will mark the 86th anniversary of Rudolph Valentino’s death and interest in Valentino’s death still hasn’t waned. Hollywood Forever Cemetery has hosted a memorial event on the anniversary of his death every year since 1928. He has also become a pretty popular target for paranormal investigators. The first person to kick off this trend was actually Valentino’s second wife, Natacha Rambova, who wrote a book about her life with him and how she believed his spirit would contact her. If you do a YouTube search for “Rudolph Valentino Ghost” you will find videos of ghost hunters trying to get EVPs of Valentino’s ghost. I once watched a show called Haunted Hollywood that basically suggested half of Hollywood is haunted by Valentino. Nearly nine decades later and people are still fascinated by the idea of making contact with The Great Lover. 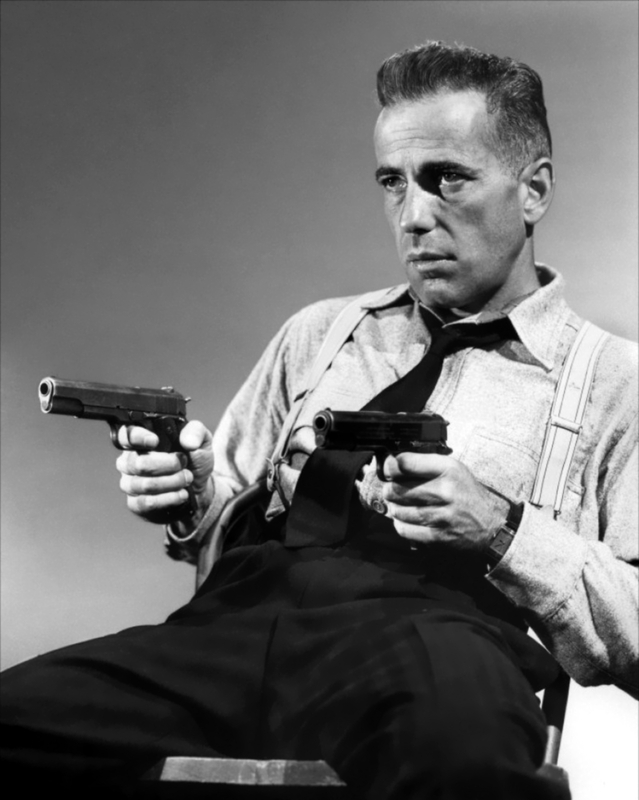 This is my second contribution for the Gone Too Soon Blogathon hosted by Comet Over Hollywood. Please head on over there and check out some of the other wonderful contributions! It looks like May is going to be a pretty busy month on TCM! 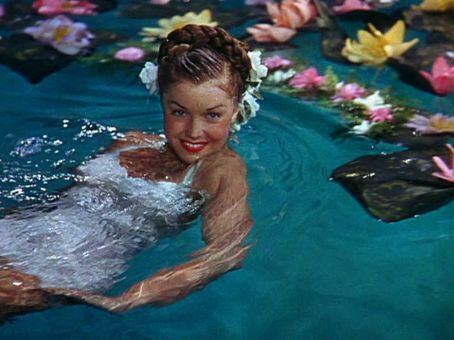 Esther Williams is the Star of the Month and since her movies tend to make me want to spend some time in the pool, I’d say she’s a good choice to help get you in the mood for summer. This month you will also get a chance to catch the series Moguls and Movie Stars again. If you missed it when it premiered back in November, it’s very much worth checking out. Near the end of the month will be TCM’s annual Memorial Day weekend marathon of classic war films. There are also a lot of great birthday tributes coming up including Jimmy Stewart, Katharine Hepburn, Bing Crosby, Henry Fonda, Audrey Hepburn, and Rudolph Valentino. Posted in TCM and tagged Audrey Hepburn, Bing Crosby, Esther Williams, Henry Fonda, Jackie Cooper, James Stewart, Katharine Hepburn, Rosalind Russell, Rudolph Valentino, Simone Simon on April 29, 2011 by Angela. I don’t think there is any news that thrills classic film fans more than news that a movie that was thought to be lost has been found. With the news that an astounding 75 lost silent films have been found in New Zealand, I’m sure many fans of silents are feeling like they just won the lottery. It’s exciting enough when just one lost film is rediscovered, but to find 75 of them is truly incredible. Among the most noteworthy finds are: Upstream, directed by John Ford; The Woman Hater, starring Pearl White; Won in a Cupboard, directed by legendary Mack Sennett star Mabel Normand; Mary of the Movies, which is now the oldest known surviving movie produced by Columbia; and Maytime, starring the ‘it’ girl herself, Clara Bow. It is believed that about 80% of films from the 1890s-early 1930s are now lost for good. In some cases, virtually nothing exists anymore from some of the biggest stars of the time. Theda Bara starred in 40 films during her career, but only three and a half currently exist. But luckily, the films of other major stars such as Charlie Chaplin, Greta Garbo, Mary Pickford, and Douglas Fairbanks fared much better and very little of their careers have been lost to the ages. There are many reasons for how films wind up being lost. In many cases, the films just weren’t well cared for. In the early days of film, nobody was thinking that anybody would be interested in this stuff a century later so they thought nothing of throwing away unused footage or entire movies that no longer had any commercial value. Sometimes films would be destroyed in order to recycle the silver in the film stock. Nitrate film stock is extremely volatile and can easily catch on fire if it is improperly stored. Fox lost all of their pre-1935 negatives due to a vault fire. If they didn’t burst into flames, they’d often just decay and disintegrate into a pile of dust. A lot of times, scenes would be cut after initial screenings to make it more marketable or due to censorship. Most famously, much of the original cut of Metropolis was lost for decades before a complete print was discovered in Argentina in 2008. And then there’s the Judy Garland version of A Star is Born. That one had to be drastically cut down after its premiere and is currently available in a nearly complete restored version, but a complete print is believed to exist. And then there’s the case of 1933’s Convention City. The entire film was intentionally destroyed because it was way too pre-code to even be censored and re-released while the Production Code Administration was in charge. Posted in News, Silents and tagged Clara Bow, Gloria Swanson, John Ford, Mabel Normand, Marlene Dietrich, Pearl White, Rudolph Valentino, Theda Bara on June 7, 2010 by Angela.